Young adults from the surrounding region join seminarians at St. Charles Borromeo Seminary for a Theology on Tap session April 20. 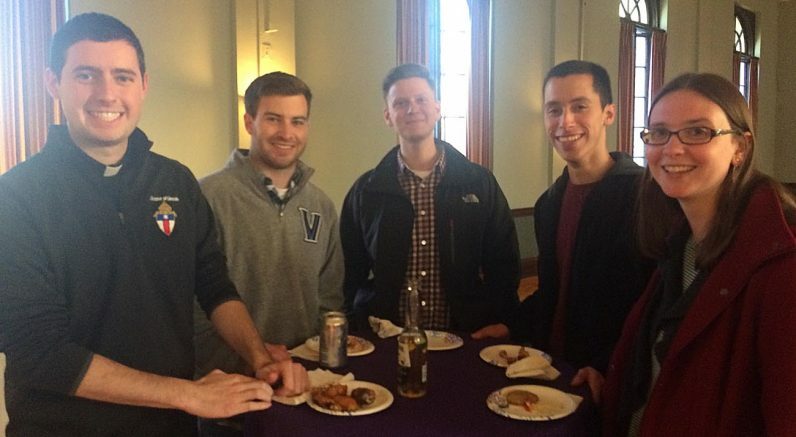 About 300 young adults filled an auditorium at St. Charles Borromeo Seminary on Friday, April 20 for a Theology on Tap session that included a talk by NFL sales executive Matt Falcone, a performance by the seminary band, food, drinks and friendly fellowship. The seminary hosts its Theology on Tap semi-annually and each one includes a guest speaker. While the seminarians themselves host the event, they rely on local parishes to donate items for raffle prizes and refreshments. This time, St. Gabriel and St. Patrick parishes generously contributed. “It brings people together from parish communities and colleges to share their faith and promote vocations for married and religious life,” said Deacon Richard Lyons of New York City, a seminarian who is studying for the Diocese of Harrisburg. Organizers try to find a secular speaker who can talk about “how they live their faith within their work,” said Kyle Mummer of the Diocese of Raleigh, who is chair of the seminarians’ Theology on Tap. Some of the people in attendance had come to a Theology on Tap event before, while for others the Friday night event was their first. Erica Deegan, a parishioner of St. David Parish in Willow Grove, was invited by her friends to come for the first time. “They talked of how much fun they had the last time,” she said. Karen Ortechowski of Chestnut Hill, a member of St. Raymond of Penafort Parish in Philadelphia, came for her third time. After some social time, Bishop Timothy Senior, rector of St. Charles Seminary, began the evening with a prayer followed by the keynote speaker. During his talk, Falcone focused on conquering adversity through prayer while also sharing his own experiences. Originally from Palmerton, Pa., he made his way to Temple University where he played Division I football for the 2009 season and studied marketing. He found work in New York City with the Discovery Channel before he eventually ending up at the headquarters of the National Football League. College football was a big commitment for Falcone. He practiced seven days a week but never missed Mass at Temple’s Newman Center. Determined never to give up his faith, he read the Bible and watched videos during free time. “I grew in my faith,” he said of his experience at Temple. Falcone faced some tough luck when he tore the ACL ligament in his knee early in his sophomore year. He tore it again in his junior year and yet again the year later. “I felt like I was falling behind,” he said. Although Falcone wanted to play football, he saw God had a different plan for him at the time. He landed an interview with the Discovery Channel in New York and was offered a job the following July. “I missed football but I knew I would probably never play again,” he said. One day, however, he found an opening with the NFL. He was called in for an interview despite only two years of work experience, so he prayed hard about it. “I knew it was my calling,” said Falcone. A second interview with a vice president of the company followed by a third with the senior vice president led to several months of preparation and waiting before he finally was offered the job. Following the talk was a performance by the seminary band consisting of Max McGallagher, Mark Toban, Phil Maas and Giuseppe Esposito. Attendees seemed impressed by Falcone’s talk including Briana Zembruski, a parishioner of SS. Simon and Jude in West Chester. She came to the event for the first time along with her sister and hopes to attend again. Deacon Patrick Muka, who will be ordained a priest in May, thought the talk might help people take in what they hear in church on Sunday and carry it with them throughout the week. The event concluded with exposition of the Blessed Sacrament and Night Prayer in St. Martin’s Chapel.